First we decluttered, then we cleaned, then we organized, this week we're going to go through and decorate. Decorating is the fun part! 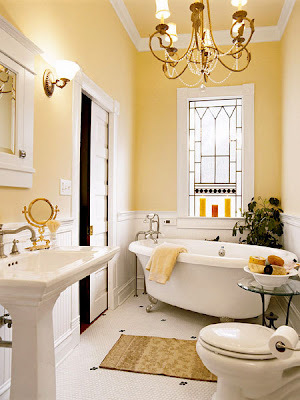 I actually think bathrooms like kitchens are one of the easiest rooms for adding a touch of fall. 1. Hollow out a small pumpkin, fill with wet floral foam and use as a vase for a floral arrangement on the counter. 8. Wash a still pliable yellow, gold or red leaf gently with soap and water, place in the center of a cream ceramic soap dish. Secure leaf with a hot glue dot or scrapbooking glue dot, and use soap dish. 9. Add a cozy bath rug to the floor to take the chill off in the cooler mornings. 10. What's your favorite autumn decorating tip for the bathroom?